Gold boxes were among the most sumptuous works of art created in the 18th century and the Gilbert Collection formed over thirty years by Sir Arthur Gilbert and his late wife Rosalinde is one of the richest and most comprehensive in the world. 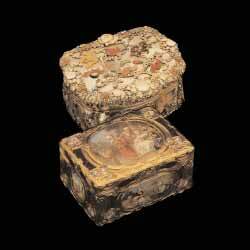 Craftsmanship of extraordinary virtuosity was used to fashion boxes, mainly used for snuff, from such costly materials as gold, silver, rock crystal, ivory, tortoiseshell, mother-of-pearl, diamonds and other precious and semi-precious stones. While gold is the unifying factor, and some boxes are entirely made of gold, the remarkable range of materials also includes Oriental lacquer, micromosaics, porcelain, enamel and painted miniatures. The inhaling of snuff was first noted by Fra Ramón Pane who travelled to the New World with Christopher Columbus on his second voyage in 1507. The habit was in evidence in Europe in the 16th and 17th centuries and by the 18th century it had become universally popular. Taking snuff became an elaborate social ritual throughout the courts and salons of Europe and, just as stylish cigarette cases made by such firms as Fabergé and Cartier were fashionable in the first half of the 20th century, expensive and elaborate snuff boxes were an important fashion accessory in the 18th century. These boxes not only provided a vehicle for the display of wealth and taste but also played an important role as official gifts to ambassadors, courtiers and foreign heads of state. All the major centres of gold box production are represented in the Gilbert Collection including Paris (the most important), London, Geneva, Berlin and St. Petersburg. Many of the boxes have historic and very grand provenances and the apex of the collection is the group of six dazzling examples made for Frederick the Great of Prussia, the largest group outside Berlin. Frederick was obsessed by gold boxes to the extent that he was reputed to have owned no less than 300. While each of the six boxes in the collection is very different from the others, they are all distinguished by their great size and lavish use of precious stones and carved hardstones making them literally a part of the Crown Jewels of Prussia. The most flamboyant is a cartouche-shaped, varicoloured-gold-mounted mother-of-pearl snuffbox set with a profusion of diamonds and encrusted with flowers and foliage of citrine, amethyst and coloured or foiled quartz. The practice of putting coloured foil backing to quartz and diamonds is /2. seen on other Frederick the Great boxes including an oval green chrysoprase box mounted in gold and encrusted with scrolls and flowers in diamonds on the lid, sides and base. There is also a cartouche-shaped box of rich brown agate, mounted in gold and set with four large cushion-shaped diamonds and a profusion of smaller diamonds. Equally lavish is a cartouche-shaped gold-mounted black marble box encrusted with bouquets of hardstone flowers, the panels bordered by gold chased with scrolls, shells and foliage while a more restrained example is a boat-shaped apricot agate box mounted in three colours of gold exquisitely chased with flowers and shells. Other boxes with royal provenances include a French tortoiseshell example with engraved gold inlay and a fine portrait miniature of Philip V of Spain set into the lid. It was probably a gift from the King to his wife Isabella Farnese of Parma whom he married in 1714. A circular varicoloured-gold snuffbox, the cover set with a miniature of Napoleon in his coronation robes and the initial N on the base set in blue enamel, made in Geneva circa 1812, was allegedly presented by Napoleon to Countess Maria Walewska. A box which may have originally belonged to Louis XVI and certainly belonged to Baron François Hüe who was valet to the unfortunate dauphin, who died in prison at the age of ten, was made in Paris by Pierre-François Drais, in 1777-79. This box is decorated with six extraordinarily detailed miniatures in gouache of hunting scenes painted by a member of the van Blarenberghe family. Another box made by Drais, 1772-73, in gold and enamel, is one of the most impressive and important French gold boxes of the neo-classical period, combining the most refined design with chased plaques of exceptional sophistication. The internationalism of gold box manufacture is illustrated by a French snuffbox by Joseph-Etienne Blerzy, 1786-87, with a musical automaton made in Geneva. The cover is chased in four-colour gold with amorous couples in a landscape between a castle and a cliff. In the background an automated merchantman in full sail moves across the open sea. One of the finest surviving pieces of English enamel work and the most remarkable English piece commemorating a tontine is a snuffbox by Jasper Cunst and the great enameller George Michael Moser, London, 1764-65. A tontine was a financial arrangement whereby a group of people invested capital and received the interest as income which increased with the death of each participant, the residual capital going to the last surviving member, in this case Sir Charles Price whose arms are engraved on the cover. The interior of the rim of the gold box is set with an enamel plaque depicting a wooded glade with a mourning figure and Time flanking a memorial inscribed with the names and dates of death of the members of the tontine. Another extravagant gold box decorated with enamel scenes of Don Quixote attributed to Moser has a hinged base which opens to reveal a watch with a white face set with emeralds and bordered by rubies. Virtually every European capital was influenced by Parisian social habits and St. Petersburg was no exception. The Gilbert Collection has an important group of Russian boxes including an outstanding varicoloured gold box chased and applied with figures in classical landscapes, the cover encrusted with diamonds and with numerous rose diamonds around the borders. The box may have belonged to Empress Catherine the Great and was presented by her son Grand Duke Paul to Nathaniel Dimsdale, the son of an English doctor who advocated inoculation against smallpox. He was asked by the Russian ambassador to the Court of St. James to visit Russia and advise Catherine during the Russian smallpox epidemic of 1768. Dimsdale senior successfully inoculated both the Empress and her son and was handsomely paid with money and titles as well as this superb snuffbox. A group of German porcelain boxes includes a gold-mounted hard-paste Meissen porcelain snuffbox in the form of a sealed letter. The most interesting feature of the box is the exquisitely painted view of London in the interior of the lid showing St. Olaf's Church in the foreground and Old London Bridge and the Tower of London in the distance. The display of objects of such complexity, designed to be held in the hand and examined closely, presents a challenge. In Somerset House they were shown in small groups so that each could be appreciated as an individual work of art, while an innovative method was devised to give a floating effect, enabling the visitor to appreciate the outstanding craftsmanship by seeing them from different angles. The Gilbert Collection of gold boxes surpasses in number and significance the other great collections in this country to be found in the Victoria and Albert Museum, the Wallace Collection and the Rothschild collection at Waddesdon Manor in Buckinghamshire. These opulent and prestigious artefacts are not only luxurious toys but are also of aesthetic and art-historical importance, showing in miniature a complete repertoire of techniques, styles and materials used by the greatest craftsmen of their age. We are very grateful for Sue Bond's help in putting this article together.